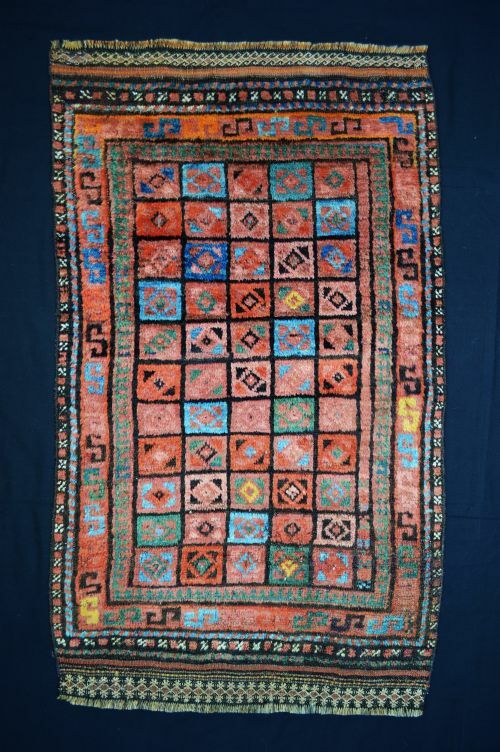 I love the vibrant, playful natural colours in this little 19th century rug made by Taimani nomads in western Afghanistan. The wool is lustrous and the brocaded skirts remain intact at each end. The Taimani belong to a group of tribes referred to as the Chahar Aimaq, where 'chahar' means 'four' and 'aimaq' is a Mongolian word for 'nomad'. They inhabit a large area of west-central Afghanistan, particularly around Charchagan in the provinces of Ghor and Farah and are, by far, the largest of the Chahar Aimaq confederation. Rugs of the Taimani have been, and continue to be, incorrectly labelled 'Baluch'. A charming and delightful little rug. Size: 1.10m x 0.65m (3' 7" x 2' 2").